For E. Ramesh, it started off with headache, memory loss, skin and tooth infections. Exposure to deadly mercury for over four years has left him impotent, he says. “My wife had to undergo abortion eight times. There is constant pain in my left foot as the skin infection has affected the nerves,” he said showing his left foot. Mr. Ramesh, 49, is among many ex-workers of the thermometer manufacturing unit of Hindustan Unilever Ltd. (HUL) in Kodaikanal, Tamil Nadu, who resigned from the company after exposure to hazardous mercury. 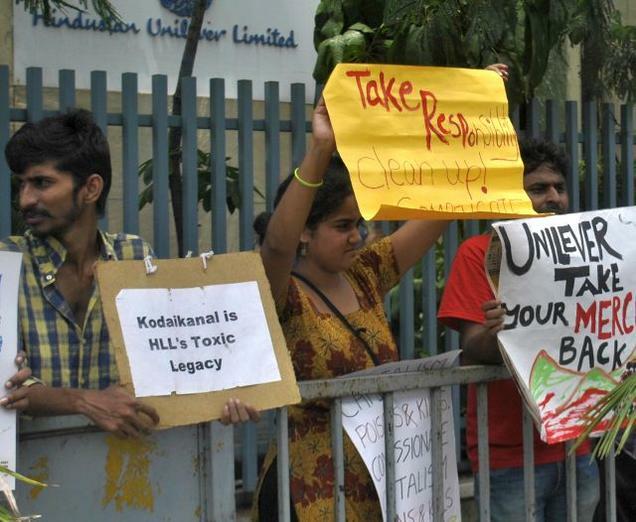 The unit was shut down on March 7, 2001, after a spate of protests, but workers claim that tonnes of hazardous mercury waste continue to lie scattered around the unit compound in Kodaikanal. On Monday afternoon, accompanied by 10 affected co-workers, their family members and activists, Mr. Ramesh staged a demonstration outside Unilever House in suburban Andheri where Hindustan Unilever Ltd.’s annual general meeting was scheduled. “Since 1983, 48 workers have died for various reasons related to mercury poisoning,” said Mahendra Babu, president of the Ex-Mercury Employees’ Association.